Indian were at the forefront of motorcycle design during the pioneer years, introducing many innovations including sprung frames and electrical lighting systems at a time when their rivals were still employing designs not far removed from those found in the contemporary cycle industry. In 1911 they secured the first three places in the Senior TT with machines equipped with countershaft gearboxes and chain drive. Throughout the twenties and early thirties they continued to offer innovative solutions and adapted to the change in the North American market place that saw the motorcycle as transport threatened by the advent of affordable, mass produced motorcars such as the Model T, successfully transforming their products into "lifestyle" accessories long before the concept had been invented. Although they produced successful single cylinder models, influenced by the sporting machines produced in the UK the Springfield factory was best known for their large capacity vee twins and the illustrious line of four cylinder machines. The fours origins lay not in Springfield, but instead in Philadelphia, where following the sale of the Henderson four cylinder design to the Schwinn company, William, or Bill Henderson established a new company, the ACE Motor Corporation to produce a range of inlet over exhaust, inline four cylinders ranging in capacity between 1168cc and 1266cc. The ACE company survived until 1927, despite the loss of its founder in 1922 when he was killed testing a new model, however, the deteriorating economic climate resulted in the ACE marque being purchased by Indian. The fours continued to be marketed under the ACE brand until 1929 when they became the Indian 4. 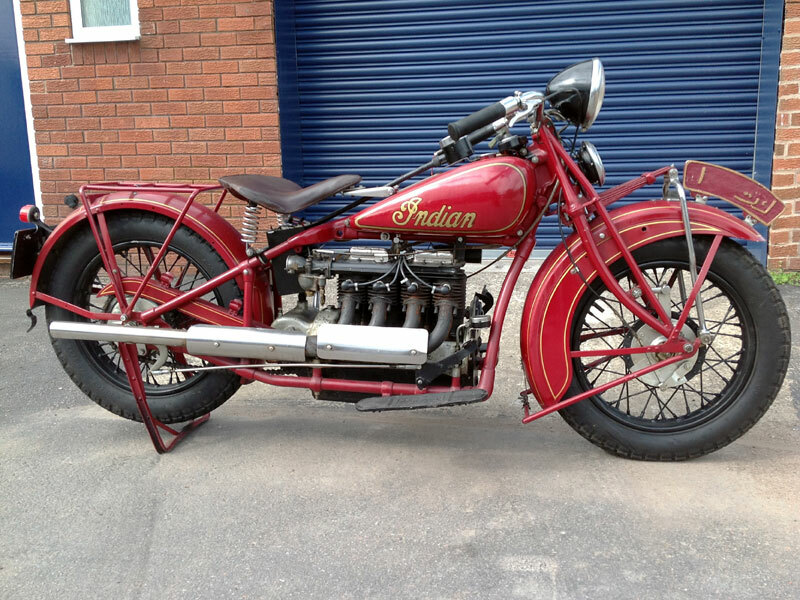 By the early thirties the Indian 4 was well integrated into the existing range sharing features such as the leaf sprung fork with their vee twin powered siblings. This example dating from 1935 is presented in good condition throughout. It appears to have been maintained rather than restored and is offered in running condition with an MOT, Swansea V5C and buff log book. A fine example of one of the most iconic motorcycles produced.